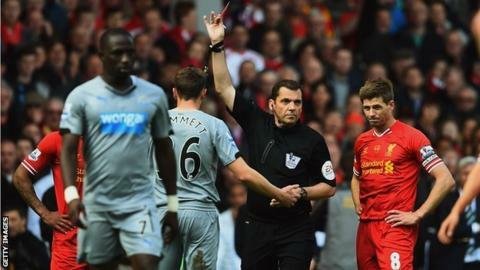 Newcastle United defender Paul Dummett has won an appeal against his red card in Sunday's 2-1 Premier League defeat by Liverpool at Anfield. Dummett, 22, was sent off by referee Phil Dowd for serious foul play following a challenge on Luis Suarez. An Independent Regulatory Commission hearing on Tuesday upheld Dummett's claim of wrongful dismissal. "The standard punishment has, therefore, been removed with immediate effect," an FA statement read. The Wales Under-21 international escapes a potential three-match ban and will be available for Newcastle's first match of the 2014-15 season. Newcastle manager Alan Pardew had condemned Dowd's performance in his comments after Sunday's match, stating that the decision to send off Dummett and Shola Ameobi had played a part in his side's defeat.